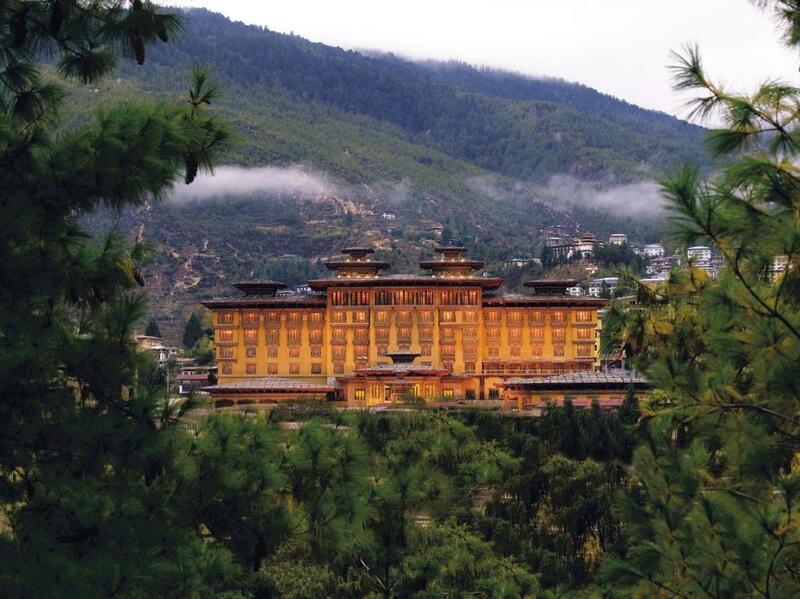 Lock in a great price for Taj Tashi Bhutan – rated 8.4 by recent guests! 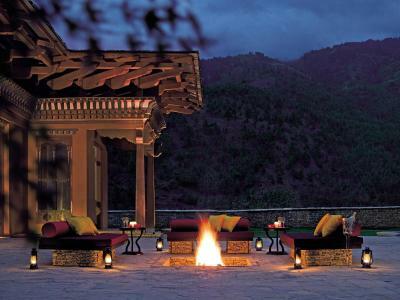 5-star luxury awaits guests at Taj Tashi Bhutan, in the heart of Bhutan’s Thimphu Valley. 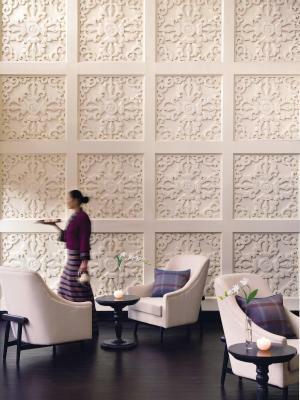 Featuring elaborate Bhutanese architecture, the hotel provides a fitness center and luxurious spa. 4 dining options are available in the hotel. 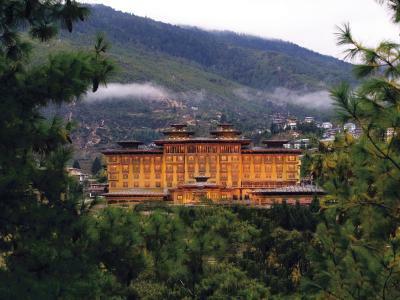 Taj Tashi Bhutan is 4 miles from Buddha Point Thimphu. Paro International Airport is 37 miles or an approximate 1-hour drive from the hotel. The stylish rooms feature wooden décor, with select ones providing stunning views of Thimphu Valley. A flat-screen TV, minibar and tea/coffee-making facilities are provided. The suites include walk-in closets and luxurious bathrooms with a stand-alone bathtub. 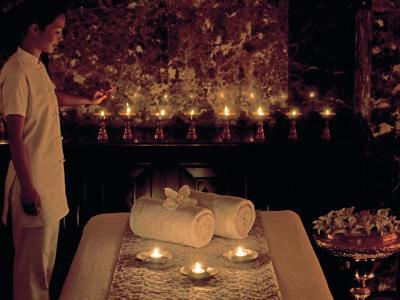 Guests can unwind in The Jiva Spa, featuring a spa menu of Indian healing therapies. 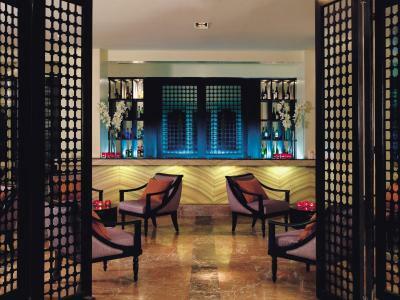 A concierge desk and business center are available to assist guests. Currency exchange and ticket services are available for guests' convenience. 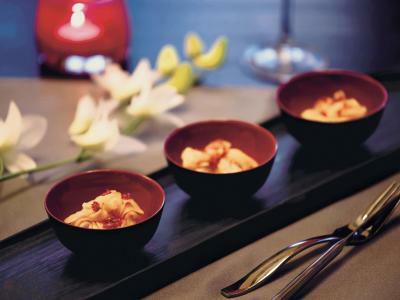 Chig-ja-gye and The Thongsel specialize in Bhutanese cuisine, and drinks are featured in Ara and Rimps. Room service is also available. When would you like to stay at Taj Tashi Bhutan? This stylish room has wooden decor fitted with a flat-screen TV, minibar and tea/coffee-making facilities. Free toiletries and a hairdryer are included. This larger room offers views of Thimphu Valley and a corner location with added privacy. The bathrooms include floor warmers and towel heaters. This suite features a separate living room and a walk-in closet. 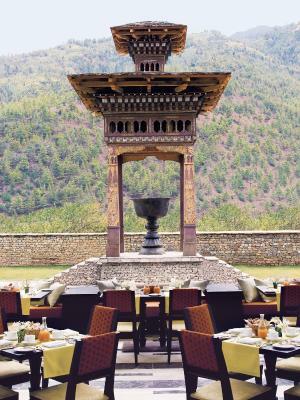 On higher floors of the hotel, it offers sweeping views of Thimphu Valley. The bathrooms include a standalone bathtub in addition to floor warmers and towel heaters. This spacious suite has Bhutanese architecture is on high floors of the hotel. 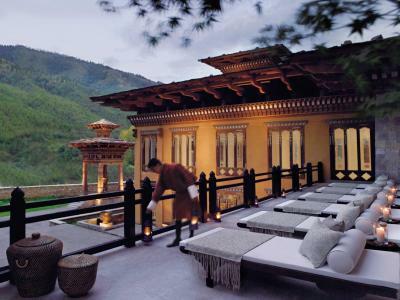 It features stunning views of Thimphu Valley from both sides of the suite. It has a large living room and walk-in closet. 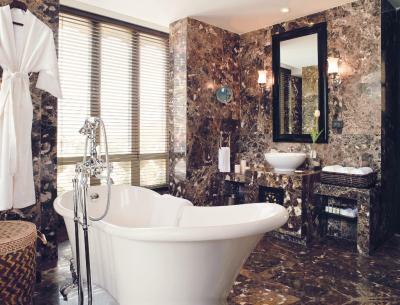 The marble bathroom includes a standalone bathtub, in addition to floor warmers and towel heaters. This stylish room has wooden decor fitted with a flat-screen TV, minibar and tea/coffee-making facilities. Free toiletries and a hairdryer are included. It includes a private sitting area. This luxurious duplex suite features independent living and dining areas. House Rules Taj Tashi Bhutan takes special requests – add in the next step! Taj Tashi Bhutan accepts these cards and reserves the right to temporarily hold an amount prior to arrival. Please note that guests have to have valid Visa and pay the appropriate government taxes (14 days required for processing the Visa - a color scanned copy of the passport is required for processing as well) to avail the benefits of all Special Offer rooms. The hotelier can be contacted for further details. Please note that as per the government law set by the Tourism Council of Bhutan, all foreign nationals except nationals from India, Bangladesh and Maldives require a visa to enter Bhutan. The property can assist you with Bhutan Visa via their travel partner. The following rates will be applicable in order for them to process your visa. They would require a scanned color copy of your Passport – Should be valid for more than 06 months from the date of travel. They need 05-07 working days to process Visa. Visa payment can be paid with the help of Credit card and please be advised that the Bhutan visa cost is over and above the room rates. For more information please feel free to contact the hotel. The facilities are pretty normal like any 5 star. The dinner at Taj in the Bhutanese restaurant was phenomenal.. worth every penny.. must visit for dinner. The traditional Bhutanese costumes provided for the whole family. Excellent gesture and well availed! Post office closeby - guests should not forget to get postage stamps with their pics. Quite unique. Great view, Excellent service, Great staff. We had a wonderful stay at Taj Tashi... every one of their staff was always eager to ensure we had an excellent experience. The check-in was a breeze and our room with a balcony was quite spacious, with a wonderful view of the mountains. It is right in the center of the city, yet so calm. Our trip to Bhutan was to celebrate my birthday, and my wife wanted to arrange a small midnight celebration. Most hotels would have decorated the room and provided a cake, and that's what I was expecting. However, Tshomo secretly arranged that... and much more. Our room was decorated with lots of balloons and we had a special In-Room bath, with their signature oils and bath salts, waiting for us after we returned from a Thimpu sightseeing trip. They also arranged for us to be dressed in traditional Bhutanese attire, which was great fun. 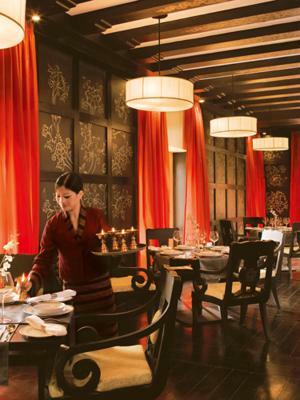 We had booked our dinner at their Bhutanese restaurant, which was again a wonderful experience. Palden took such good care of us... she and my wife became good friends by the end of our meal. At midnight, one of their staff rang the doorbell and invited us to the lobby. To our surprise, they had decorated a small private dining area where their staff joined in for a cake cutting celebration. I was also given a personalized photo-frame and a wonderful gift. I still can't figure out how Tshomu could arrange so much at such a short notice. The breakfast spread is huge and the service is excellent. I am still in awe of the level of personal touch everyone in Taj Tashi's team brought to our overall experience. We would love to come back and stay here again, just for the wonderful, personalized service. Few excellent dishes but average buffet. Slightly overpriced but can be justified by the location. Stunning location,great staff,clean and great service. They organised Bhutanese dresses for us and made us feel on the top of this world. Reception and restaurant staff are super! For Indian Travellers: They do not accept the new INR 2000 & 500 denomination notes. Credit cards and debit cards issued in India are not valid for transactions. Advise: Carry U$D currency and convert into Bhutanese NU. The staff were very helpful and extremely polite.